Cruise ships will tender you close to the center of town. 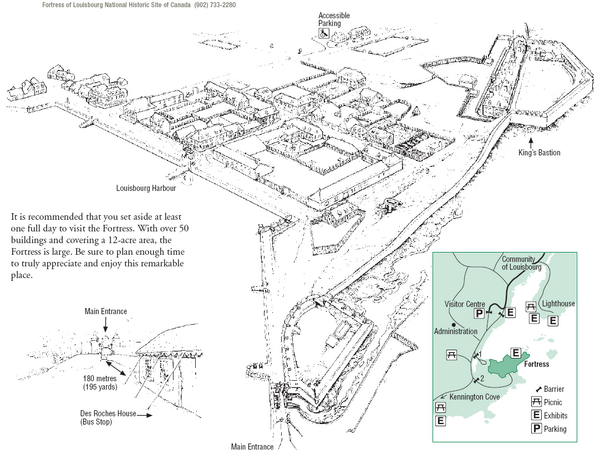 Louisbourg is located beside the Fortress of Louisbourg National Historic Site. Besides this interesting historic treasure, beautiful island and magnificent seascapes and beaches also await you in Louisbourg. The Cape Breton Highlands National Park and the Cabot Trail are also within easy driving distance as is the Alexander Graham Bell Museum at Baddeck. The Fortress of Louisbourg National Historic Site is the major attraction. This is Canada's most ambitious historical reconstruction of a part of the 18th-century French fortified town of Louisbourg.